In the morning I am heading to Venice, Italy for a week. I am so excited! I have wanted to see Venice in person for nearly 20 years. My fascination with it began when I was studying Renaissance Art during my senior year of college, but intensified in 1999 after I first accidentally stumbled upon a showing of “Dangerous Beauty.” The movie is a fictionalized/idealized narrative about a woman named Veronica Franco, and she is one of my personal heroes. Like many gay men, I adore strong women. They’re just so… FIERCE! And Veronica is famous, not only for her beauty and intellect, but also for being clever enough to outwit the Inquisition after she was accused of being a witch. 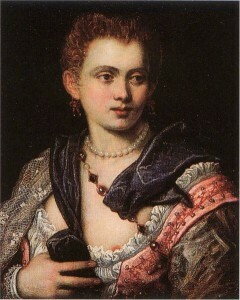 She was one of the most famous cortigiane of her time (N.B. The title of this site, and the use of the word courtesan, is a reference/homage to her), and she even entertained the Henri III, King of France (as well as many other highly influential people). You can read a good article about her here, or you can find a nice, short overview on Wikipedia. I have a copy of her collected letters along with many of her poems. It was sent to me by a friend from Scotland, and she gave it to me for Christmas recently. I will have it on the plane with me. To Venice! A piu tarde tutti gli miei amici! Devon, first off let me say I feel stupid for not finding your blog, and website sooner. Where have I been?! You are a true inspiration! Can’t wait to here all about your trip to Venice! How exciting. Hope you make memories for a lifetime.